New World Cafe is a tasty surprise in the middle of meat and corn country. 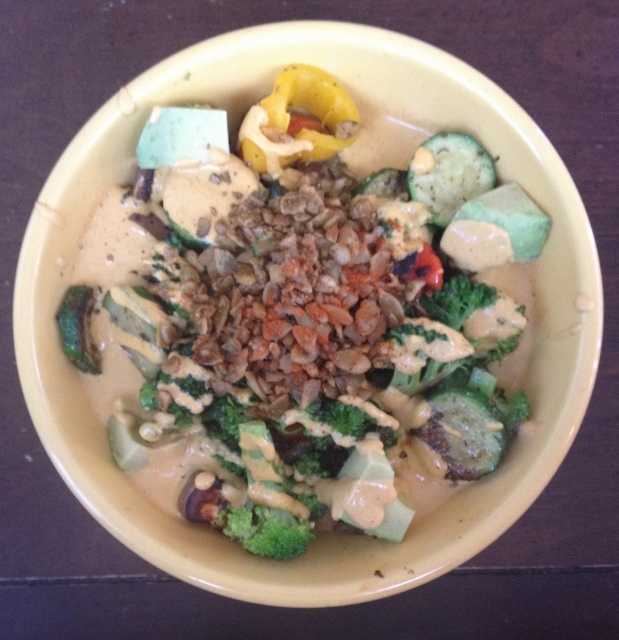 Even as a life-long Midwesterner who has had amazing vegan meals all over this part of the country, finding a vegan gem in Iowa surprised me. Discovering that they make nearly all of their dishes gluten-free? Almost unbelievable! Well, until I walked up to the counter to order. I quickly became a believer! As always, I’ve got lots of questions. Is this gluten-free? How about that? The dishes that interested me were already gluten-free, no modifications necessary. Super easy! Since my favorite fella was dining with me, we got to try two items from the weeks menu. New World Cafe’s menu changes weekly, so what we had to eat may not be what is on the menu when you visit. I like that their menu changes often and that they feature produce from local organic farms. 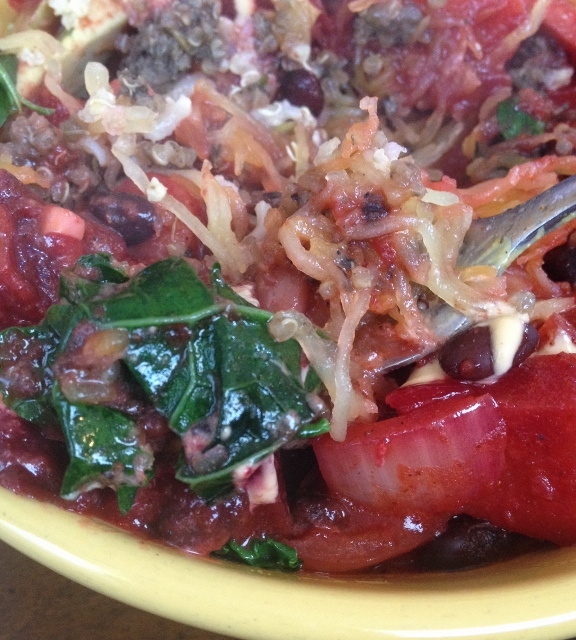 I had the Chili Bowl, a root veggie and bean chili with herbed mushroom-quinoa crumbles, roasted spaghetti squash, garlicky kale, chipotle cashew cream and avocado. I’m a fan of veggie chili and we eat it often at home. There are several recipes right here on my site for veggie chili, but I’m going to admit none are as good as New World Cafe’s chili. The addition of root vegetables, including beets, into this chili added a brilliant color and depth of flavor I’ve never experienced in veggie chili. The herbed mushroom-quinoa crumbles were interesting, almost like a mini meatball. Everything about this was delicious. My fella had the Mexican Bowl with gluten-free grains, beans, roasted potatoes and yams, veggies, avocado, green herb salsa, smoky cashew “cheese” and pumpkin seed crumble. Hearty, spicy, warming on the cold, snowy day of our visit. Often when folks who don’t eat a plant-based meal think of vegan food, they think of lighter fare or salads. This was as hearty as any meat dish I’ve had. 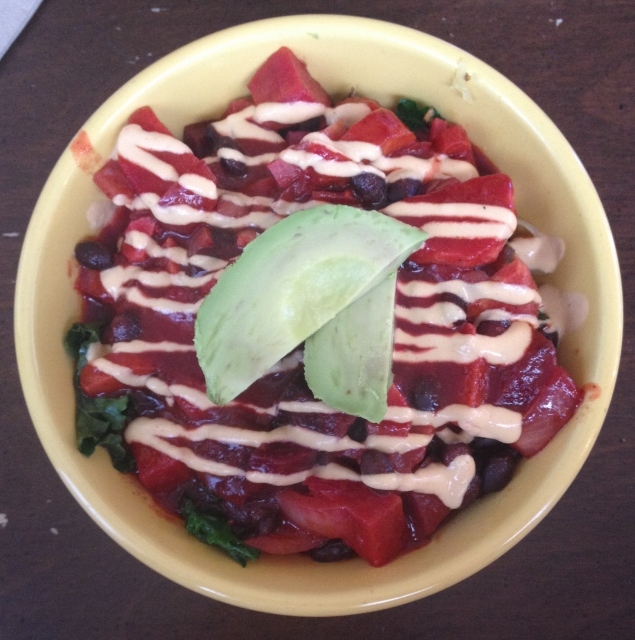 I noticed something on the menu I’ve only seen before at Cafe Gratitude: a bowl with grains, beans and various toppings, all for a donation. This concept of “pay what you can afford” wins me over as a customer. I believe everyone should be able to have a warm, healthy meal and it makes me happy to see restaurants standing up to make this happen. On our way out, I stopped at the counter to order a chai. Did I mention it was cold out when we visited? 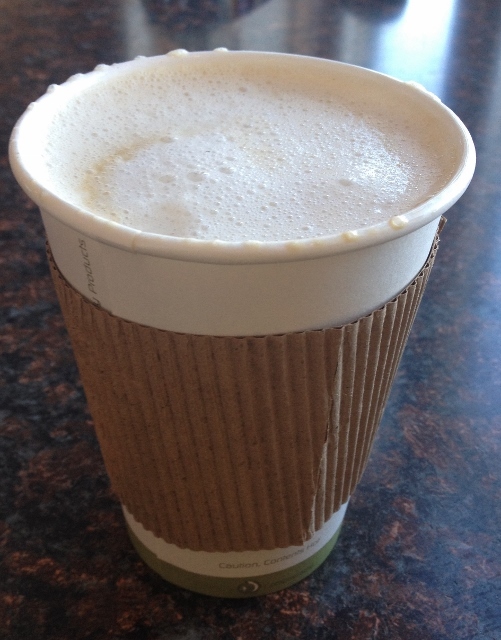 Windchills well below zero justified my purchase of a coconut sugar-sweetened chai made with hemp milk. I must have exclaimed at least five times, “I can’t believe I got this in IOWA!” It was the perfect beverage to keep me warm for the drive back to Kansas City. While I didn’t sample them, New World Cafe also makes fresh juices (I saw an entire bunch of kale being fed into the juicer while my chai was being made), a few baked goods like cookies and brownies and smoothies. They also have brunch on Saturday! 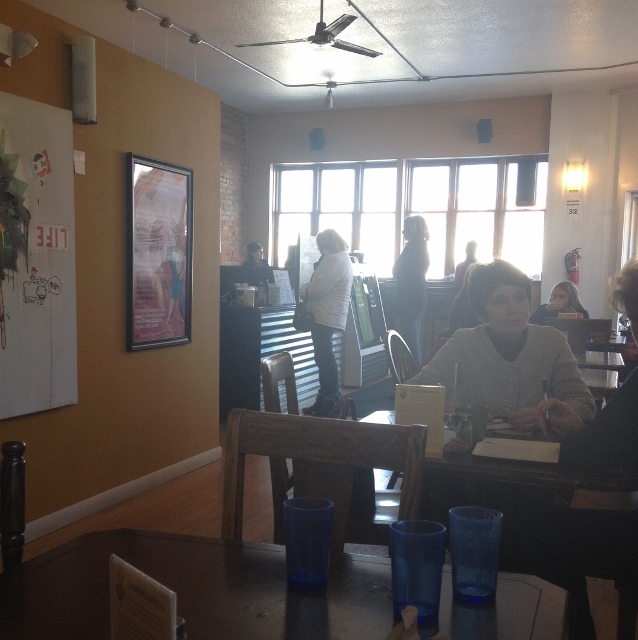 New World Cafe was busy, even on a cold weekday at lunch. We ordered at the counter and waited just a few moments for a table to come available. There is also a bit of seating at the front windows, perfect for having a coffee or juice. We parked in a metered spot on the street and noticed several parking lots in the area as well. 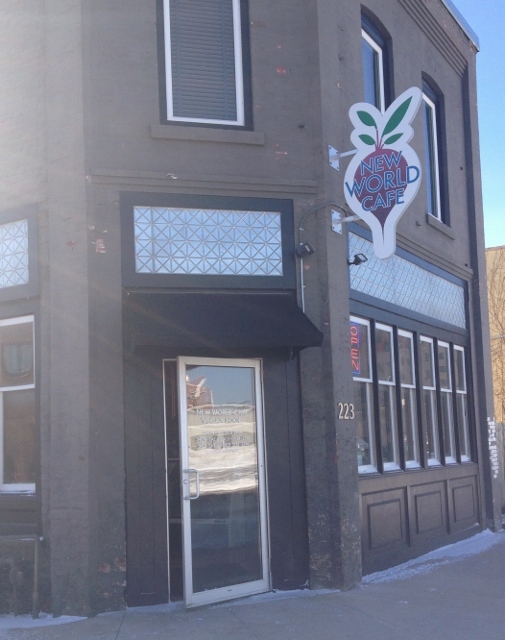 Speaking of the area, New World Cafe is located in Des Moines’ Historic East Village. The streets are lined with wonderful shops and galleries. I had a great time browsing Domestica. Some of my favorite finds from this trip were a couple of glasses, printed with bicycles, and letterpress calendar cards that have become a whimsical pennant banner on our mantle. If you are dining at New World Cafe, just walk down the block and you’ll see Domestica. You’ll need to make two trips around the store, there’s no way you can take in all of the wonderful items at first glance. Eat With: Minimal Caution. The staff were very knowledgeable on my visit and the menu lists gluten-free options. I felt comfortable dining here gluten-free. 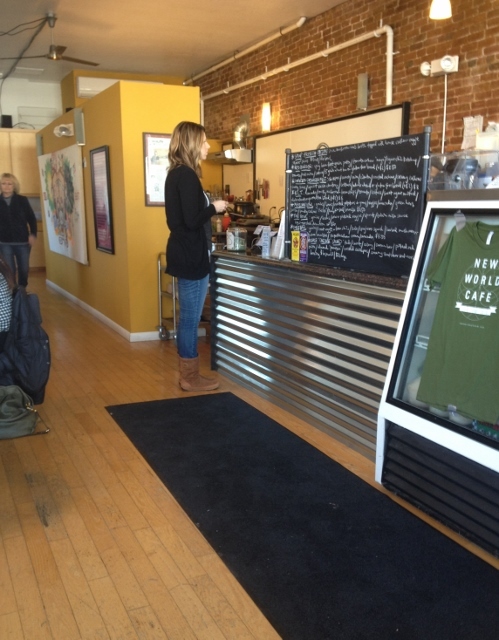 New World Cafe is located at 223 E. Walnut in Des Moines, Iowa. 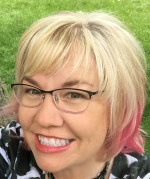 515.244.0029. Visit their website to see the current week’s menu. I’m so excited! I’m actually going to DesMoines to visit family in a few weeks. I’m going to forward this link on to them and see if we can visit! 🙂 So glad you had a yummy time there! That chili bowl looks delish! Yay! I hope you get to visit!